*International financial aid deadlines differ. Please see the deadlines for International financial aid applicants. Have you fallen in love with Wellesley? If admitted, are you ready to commit to attending? Well then. Get ready to meet Early Decision. Early Decision I (ED I) is a binding plan for students who decide that Wellesley is their first choice. The difference between ED I and Early Decision II (ED II) is that the deadlines for ED II are slightly later. You are allowed to apply to only one school under either Early Decision option. 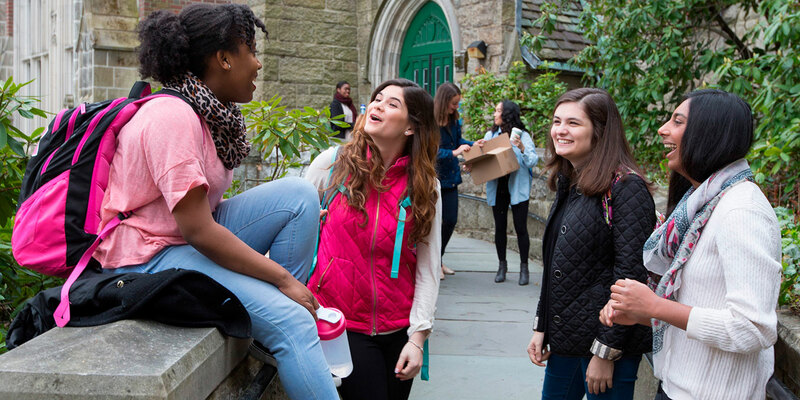 If you are offered admission to Wellesley under one of our Early Decision plans and submit your enrollment confirmation, you are required to withdraw your applications from other colleges and universities. Also, you will need to submit the $300 enrollment fee in early January. Select the option marked “Early Decision Round I.” Pretty easy, right? Standardized tests: We recommend that you complete your testing by the end of your junior year. The last possible test dates for SAT or ACT are in late October or early November of your senior year. Early Decision II (ED II) is basically the same as ED I, except the deadlines are slightly later. It is a binding plan for students who decide that Wellesley is their first choice. If you are offered admission to Wellesley under ED II and submit your enrollment confirmation, you are required to withdraw your applications from other colleges and universities. Also, you will need to submit the $300 enrollment fee by February. You are only allowed to apply to one school under the Early Decision option. Select the option marked “Early Decision Round II.” Done! Standardized tests: We recommend that you complete your testing by the end of your junior year. The last possible test dates for SAT or ACT are in early December of your senior year. This a unique option for Regular Decision candidates. At the end of February, the Board of Admission will give Early Evaluation notifications (“likely, “possible,” or “unlikely”) to candidates who select this option. Applicants will then receive their final admission decision in late March. Select “Yes” as your response. Standardized tests: We recommend that you complete your testing in October or November of your senior year. The last possible test dates for SAT or ACT are in early December of your senior year. Do you plan to apply to a broad range of schools and take time to consider many options? Regular Decision is used by the majority of applicants and will give you the most time to complete your application. The drawback to applying under the Regular Decision option is that it can take a while to hear back from colleges (sometimes as late as early April). Waiting to hear from that one last school will limit the amount of time a student has to make a final decision about which college to attend. Select the option marked “Regular Decision.” Pretty easy, right? Are you a junior who has completed your high school coursework? Can you demonstrate the academic and personal maturity necessary to compete with Regular Decision candidates? The Accelerated Admission decision plan is for high school juniors who fulfill their high school requirements and graduate at the end of their junior year (third year of high school). Strong candidates will have gone above and beyond high school graduation requirements and will have transcripts that look very similar to those of students who have spent four years in high school. Early Admission candidates will apply under the Regular Decision plan. Standardized tests: We recommend that you complete your testing in October or November of your junior year. The last possible test dates for SAT or ACT are in early December of your junior year. From product creation to Alexis de Tocqueville, First Year Seminars cover a wide range of topics. The classes are small, so you’ll get a lot of face time with your professors and individualized instruction.